What a great time to build a gaming PC. The Intel core i5 8400 presents the sweet spot in terms of performance for money and as it has to have a new motherboard the Gigabyte Z370N WiFi Mini-ITX is a great, and near compulsory, match. The board even has two M.2 slots so you can have SSDs without the untidy wiring. Near to the previous core i7 performance for less heat (and less money), the 65W CPU is even easier to cool with heat pipes. You might remember the Original Twist silent PC and now this is a gaming upgrade with more space and probably the biggest heatsink tally on the planet. 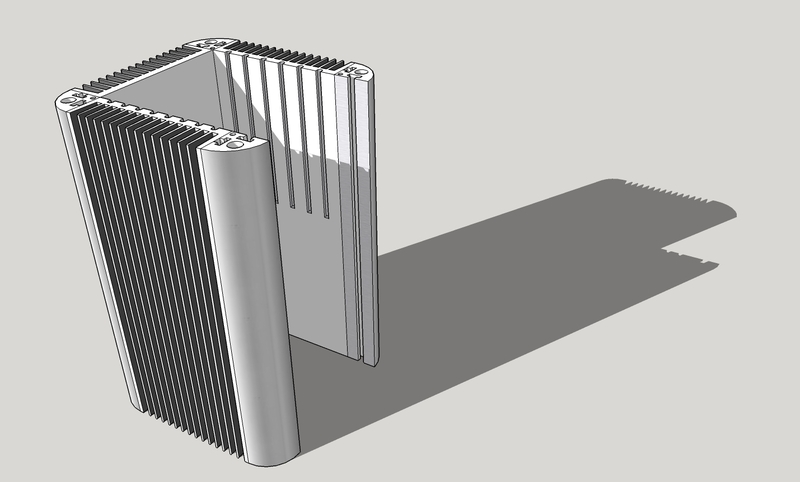 As before, the corner extrusions are ‘off the shelf’ aluminium extrusions as are the heatsinks where the supplier offers a CNC machining facility for the 6mm heat pipe channels. This section across the lower half shows a Mini-ITX board, HDPLEX 300W AC-DC and GTX 1060 GPU in position with plenty of room to spare. The heat pipes from the core i5 go above on the same heat sink, same for the GTX 1060 although it could use the space in the centre extrusion for its pipes. With CNC machining it is just as easy to have splayed channels as parallel ones so bending and fitting the pipes will be easier than usual. The case is like a tall chimney so there will be good airflow across all components, a clear advantage over flat cases with horizontally aligned motherboards. 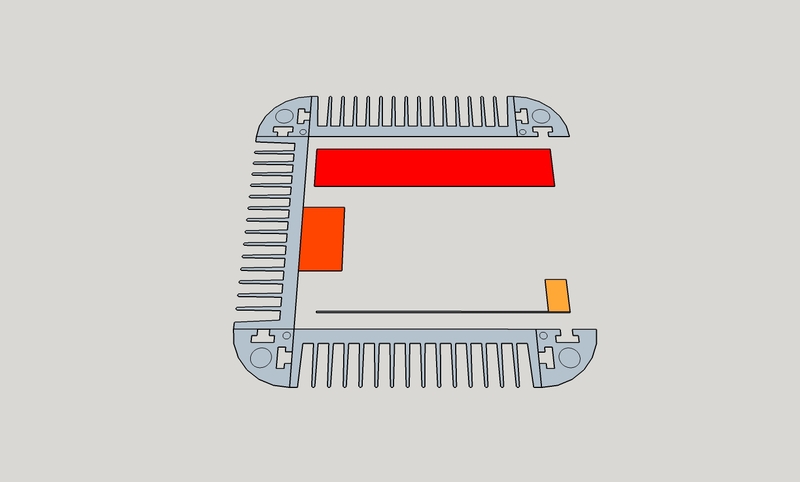 The vertical alignment of the heatpipes gives optimal performance; around twice as good as horizontal ones. By sticking the tails of these pipes slightly below the CPU block there will be more water running back down the pipes – another performance tweak which takes the potential capacity to over 100W. 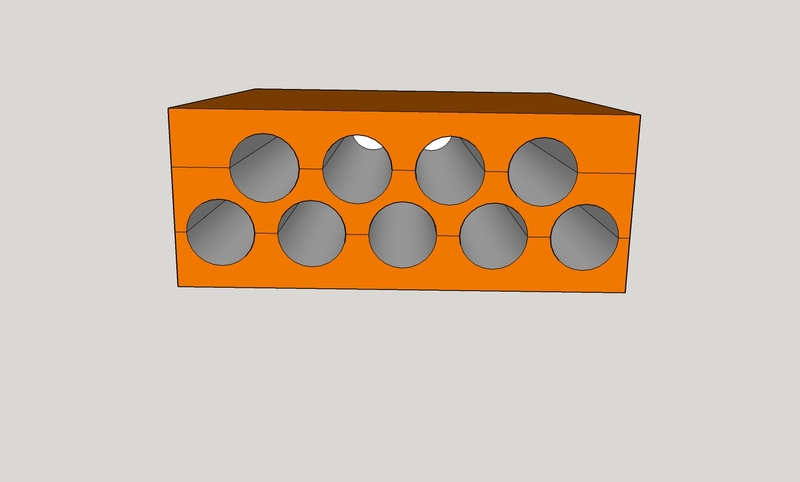 Heavy duty gamers and clockers will scoff at 100W so just for them ….. a 9 pipe copper CPU block with the pipes running up into back to back heatsinks. i.e. the pipes are clamped between an additional section of heat sink inside the case. So, 9 long pipes running vertically to doubled up heatsinks and the chimney effect even stronger. Actually there’s easily enough room on the heatsinks to fit 11 pipes from a 6 + 5 CPU block – how much power have you got? The corner extrusions are ready for m6 screws to hold on the open top and bottom plates and the feet, which could be rubber doorstops (well why not?) The perspex side cover over all the connections can be laser cut once the pattern is fixed and that job can be subbed out quite cheaply. Fancy building one? Fancy buying one? Register your interest below – opportunity knocks.